Three months have come and gone since my visit to the land down under yet I'm still nursing a vacation hangover. Kaymee set a Skype date with Joy and I over the weekend and we were talking endlessly again about our short time together in Melbourne, hoping there'd be a repeat. I'm planning to send them postcard photos just to have a little reminder of those lovely days in April. I was also chatting with Lauren the previous day and while talking, I was looking at our photos taken in Sydney- that day we braved the cold and walked along Bondi Beach. I was too ecstatic to see some surfer dudes but heck no one was out surfing that day. We got tired and hungry after walking so we ordered some fish and chips and deep-fried Mars bar to share. I was just lucky I didn't gain much weight during the 10 days that I was in Oz but man, I did eat a lot. Sydney sunset is breathtaking as can be seen from the photos below. Both shots were taken somewhere in Circular Quay, the second shot while I was on a cruise after the visit to Featherdale Wildlife Park where I fed kangaroos and pet adorable koalas. If I can just pack one little koala in my bag and take it with me to Taipei, I would have done so. They are just sooo cute. And smelly hehehe. Now I guess I need to move on and plan some other things in my life. I have no more personal trips for the rest of the year, but we'll be traveling for work in October-November and the schedule is pretty crazy I don't even wanna think about it. I have downloaded some new ebooks (sorry I'm such a cheapskate) and I'm spending time to read again. On days when I feel like my brain is empty (hahaha) and I need to learn something, I bring home issues of Time and The Economist magazines from work and try reading them from cover to cover. Aja aja! Hello, world! I miss my little online space. I miss writing on quiet nights like this so today I'm taking full advantage of my Saturday-night-in for a quick recap on things that are keeping me busy. I spent one week back home in the middle of June, mostly for a work event, but I'm glad I had the weekend off to be with my ahia and my mom who was in Manila at the time. It was the most unhurried and stress-free trip home because my goal was just to be with my family. I had a quick trip to the salon after arriving from the airport on June 19, and dropped-by Browhaus for eyebrow threading. We picked up my brother from work and the following weekend was spent shopping and bumming around. My bestfriends Monnette and Monica took me out for lunch and had a little catch up session. I also made a trip to my dermatologist Dr. Judy Cuaso because of my crazy cystic breakouts that I wrote about last time. I had my scar on my knee checked and had some skin treatments done. I'm now 95% clear, thank you Doctora Judy for always saving my skin. I went back to my old school regimen of Cetaphil cleanser plus Benzoyl Peroxide and an oral antibiotic. However, my right knee, the one that got injured last year, still has the ugly scar which my doctor said will take some time to fade. The ointment she prescribed after the injection I had last April was helluva expensive, but I think it's working and the scar has started to fade gradually. After my "work trip", I finished some reports and worked on our monthly publications. It feels like June just said hello and goodbye, then I woke up one morning and it's already the first of July. 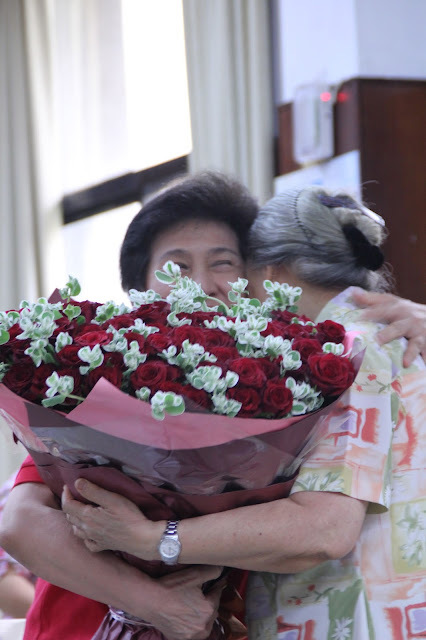 This month's highlight has got to be Auntie Florence's surprise 80th birthday celebration last July 12 at our parish hall. Heaven knows how hard we've all worked to pull off such a big surprise. I was in charge of the overall event, from the program, event script to the venue decoration. I could only think of one concept- the traditional Filipino debut celebration- so we had 80 wishes (birthday messages that I placed in a jar), 80 roses and other 'pakulo'. We had two weeks to prepare. I spent some nights working on the script, the powerpoint, photo slideshow and editing the video greetings from friends and her students overseas. It was hard work but when I saw Auntie Florence's face lit up when she entered the hall, I knew all our efforts were worth it. Auntie Florence is one of the reasons why I stand strong in all things I do. Even though I dont talk a lot about my feelings, she knows my heart well. I'm blessed to have known her :) Happy birthday, Auntie Florence! You occupy such a big space in my heart, I love you always!